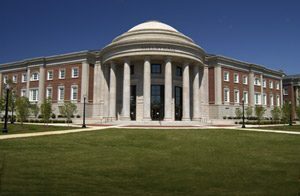 TUSCALOOSA, Ala. – The University of Alabama’s new interdisciplinary transportation and science complex, Shelby Hall, was dedicated today in an afternoon ceremony with special guests U.S. Sen. Richard Shelby (R-Ala.) and his wife, Dr. Annette N. Shelby, in attendance. Shelby Hall, UA’s new interdisciplinary transportation and science complex. The 200,000-plus square foot facility is UA’s largest academic building and one of the most sophisticated campus transportation and science facilities in the nation. Located at the corner of Campus Drive and Hackberry Lane on the UA campus, the pentagonal-shaped Shelby Hall will be the new home for UA research coalitions and centers in transportation, geosciences, energy, biosciences, chemical sciences and material sciences and will house the College of Arts and Sciences’ chemistry department. 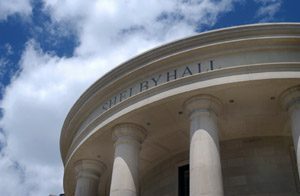 “Shelby Hall will transform the University’s research infrastructure,” said UA President Robert E. Witt. “It is the cornerstone of our effort to become a student centered, Tier-1 research university. The $58.2 million Shelby Hall will house 70 research labs, five teaching labs, three theater-style lecture halls, 40 offices for faculty and professional staff, and 80 offices for graduate students and postdoctoral fellows. Richard Shelby, Alabama’s senior senator, is a graduate of The University of Alabama’s undergraduate and law programs. He was elected to the Senate in 1986 and serves as chairman of the Senate Banking, Housing and Urban Affairs Committee; and the Transportation, Treasury and General Government Appropriations Subcommittee. Sen. Shelby also serves on numerous other committees and subcommittees. Annette Shelby is a professor emerita of Georgetown University. She specializes in management communication and has served as associate editor of the Journal of Management Communication, associate editor of the Journal of Financial Research, and on the editorial board of the Journal of Business Communication. She holds graduate and undergraduate degrees from The University of Alabama and was a former professor at the University. The architectural firm for the project was Hellmuth, Obata & Kassabaum Inc. Batson-Cook was the contractor.